Left side of the weekly reward board The Weekly Rewards at Game Station are a loyalty system. 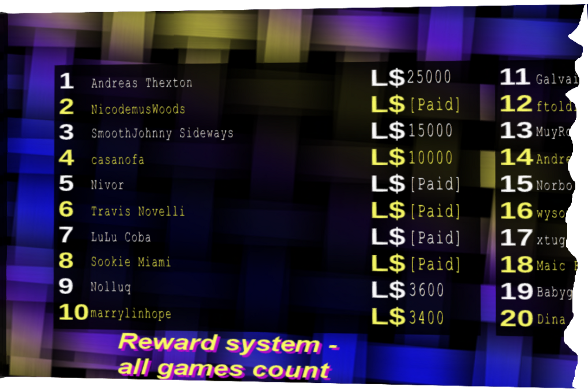 The 20 players who play the most (measured in total L$ played) during a week will be rewarded with a prize. 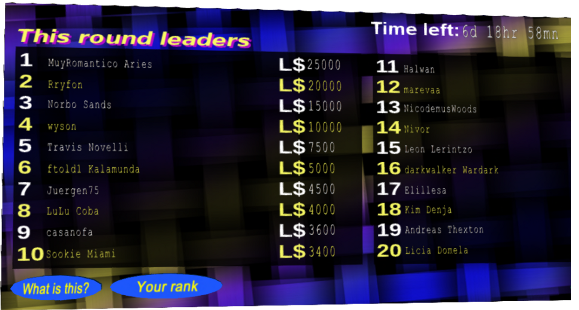 At the left side of the board you see the current contest, at the right side you see the winners of last week. When you win a prize you have to click the button Collect L$ in order to receive your prize. You can do that as long as the new contest is active. So, you have 1 week the time to collect your money. As soon as you click the button, the prize won will be paid to you.